Any bacterium that has a parasitic interaction with another organism is classified as a pathogen. Just like tetanus, C. difficile, and Leprosy, Aeromonas hydrophila is also classified as a pathogen to several organisms. 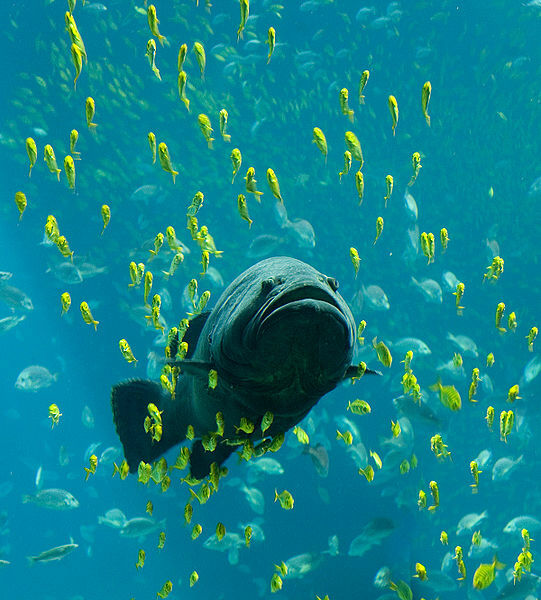 In fact, it is the most common pathogen associated with fish illness. However, because it is an opportunistic pathogen, Aeromonas hydrophila holds a greater risk of infection in hosts when the immune system is poorly functioning. This could be due to sudden environmental change or instability (changing seasons), if the host is of young or old age, if the host is infected with another bacteria or virus (including HIV/AIDS), or because of immune suppressant medications. It also becomes a greater risk when a host is exposed to contaminated water or consumes food that has been exposed to contaminated water. Therefore, aquatic organisms, such as fish and frogs, have a much higher rate of infection and their degree of infection tends to be more severe compared to humans. However, unlike streptococcus, it is not a normal inhabitant of these host organisms, yet it has been found in feces of asymptomatic individuals, a topic further discussed in the next page on public health. Once the bacteria enter the host, it attaches to the eukaryotic cell via pili and adhesions. The bacterial envelope can then fuse with the cell membrane and thus activating the T2SS, T3SS, and T6SS as discussed in the adaptation section. The signals that the bacteria receive once inside its host trigger it to colonize and secrete toxins. The virulence factors that it creates force the host's cells to benefit the bacteria rather than the host, making this a parasitic relationship. The bacteria have adapted polysaccharide capsules to persist and survive despite the host's immune response. Because of its strong virulence factors and resistance mechanisms, varying degrees of symptoms occur in the host. 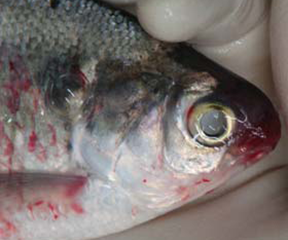 In fish, it can cause ulcers, lesions, swelling, bulging eyes or scales (due to the fluid secretion in the intestines), and hemorrhages on the exterior of the fish. Although its prevalence is less common in humans, it can cause a variety of different infections. It is most known to cause gastroenteritis in humans which can last for a couple of days to a couple of weeks in more severe cases. Symptoms include fever, abdominal cramps, diarrhea, and dehydration. Although it is resistant to several antibiotics, it is treatable using strong doses and different combinations of alternative antibiotics. Additionally, in situations where trauma has caused a penetrating injury in the skin, Aeromonas hydrophila can infect the surrounding tissue causing necrotizing faciitis, myonecrosis, or cellulitis. In such cases, it often becomes severe enough to require amputation and an observed mortality rate of 67% was associated with this type of infection. However, as noted earlier, those infected tend to have previous health conditions allowing them to be more susceptible to the infection, and these existing conditions can also be attributed to such a high mortality rate. In reflection, the pathogenic interaction that this organism has with its host can range anywhere from mild to fatal depending on these several determining factors. For more on the occurrence and pathology of the organism, go to the next page on public health.